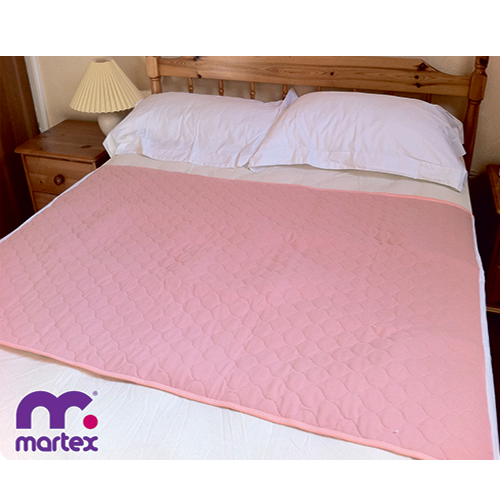 These bed pads are made using the very latest tri-lobal fibre technology to ensure maximum absorbency. These pads are probably as good if not better than the any pad on the market today. These bed pads are made using the very latest tri-lobal fibre technology to ensure maximum absorbency. These pads are probably as good if not better than the any pad on the market today. The unique one-way barrier ensures that you receive maximum protection and as much comfort as possible. They are available in pink only, absorbency 2, 3 or 4 litre with tuck in flaps. Type Two - 36" x 29" (91cm x 74cm) - 2 litre. Type Three - 36" x 36" (91cm x 91cm) - 3 litre. Type Four - 55" x 36" (139cm x 91cm) - 4 litre.